"Thurmond Clarke Memorial Library, Chapman College, Orange, California"
On mall by Thurmond Clarke Memorial Library, Chapman College, Orange, California. Sculpture by Bret Price at left. 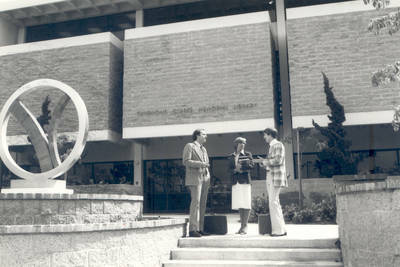 The first building constructed under the Chapman College Master Plan, this 32,000 square-foot concrete block building was dedicated March 5, 1967. Designed by architects Powell, Morgridge, Richards & Coghlan of Los Angeles and constructed by the Beatty Brothers Corporation of Tustin. March 27, 1972, the library was named in honor of Judge Thurmond Clark, Chief U. S. District Judge of the Central California District, for his lifelong commitment to education. The mall was completed in 1979. BW photograph; 3" x 4.5"